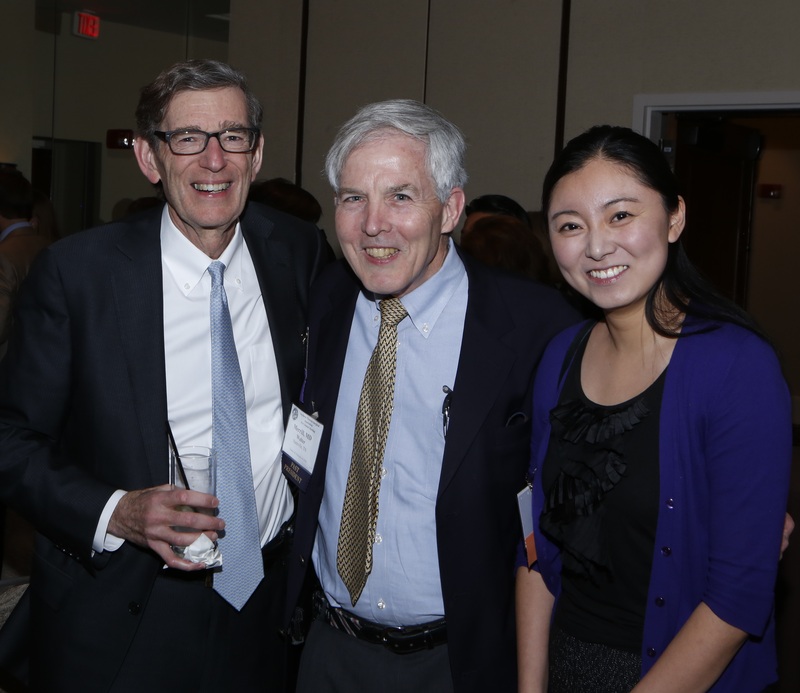 2014 STSA Brooks Scholar, Xiaoxiao Lou, attended Dr. Richard Prager’s President’s Reception during the STSA 61st Annual Meeting with her mentor and STSA Past President, Dr. Walter Merrill (center). The STSA James W. Brooks Scholarship was established in 2010 to identify and encourage medical students interested in pursuing a career in cardiothoracic surgery. Xiaoying (Xiaoxiao) Lou received a 2014 Brooks Scholarship to attend the STSA 61st Annual Meeting in Tucson, AZ where she was mentored by STSA Past President, Walter Merrill, MD. Since receiving the 2014 Brooks Scholarship, Xiaoxiao completed her medical school training at Northwestern University and matched at Emory University’s Integrated Six-year Residency Program. STSA recently interviewed Xiaoxiao about her experience attending the STSA 61st Annual Meeting as a Brooks Scholar. What did you enjoy most about the STSA 61st Annual Meeting and STSA Brooks Scholarship Program? The whole experience was amazing – the sessions were worthwhile and educational, the social events were well organized and fun, but I especially enjoyed meeting the other attendees. Dr. Walter Merrill was my assigned mentor at the meeting, and I could not have asked for a better one! He made me feel welcomed with his thoughtfulness and generosity, and made every effort to introduce me to his colleagues. Everyone I met was so supportive and encouraging, and I left the meeting even more excited about the field and inspired to be a part of it. It was truly my privilege to be included in the meeting and scholarship program! The fun and collegiality! More so than any other meeting I have attended, the STSA Annual Meeting provided a warm, social, yet academically rigorous environment. Everyone seemed to truly enjoy each other’s company, and I could tell that the people who attended are as much friends as they are colleagues. It will be my privilege to work with, learn from, and share laughs with such a wonderful group of people throughout my training and professional career. I sincerely hope to be able to be a part of this amazing Association in the future. Did receiving the Brooks Scholarship affect your level of interest in pursuing a career in cardiothoracic surgery? It only further confirmed my decision to pursue cardiothoracic surgery. I loved learning about groundbreaking work being done all over the country. And it was an incredible honor to meet so many wonderful leaders in the field – all of whom are so passionate about what they do and so enthusiastic in their support of those who want to enter and contribute to the field in the future. I am now even more excited about CT surgery and its bright future and cannot wait to get started in the training ahead. Would you recommend that other medical students apply for the Brooks Scholarship? Absolutely, no question! There are few opportunities for medical students to engage with those in the field already while learning about advances in CT surgery in a fun, academic setting. The built-in social activities provide a comfortable environment to network with other students, residents, and currently practicing CT surgeons. The Brooks Scholarship was the perfect way to introduce me to the CT surgery community. Were you encouraged by an STSA member mentor to apply for the Brooks Scholarship? If so, how did that encouragement affect your decision to apply? Yes, by my long-time mentor, Dr. Richard Lee. His mentorship and support throughout medical school have been instrumental in my personal and professional development and made me more eager to apply for the Brooks Scholarship. Have you included your Brooks Scholarship award on your CV, and if so, do you believe the designation adds value to your resume? Yes, I was actually congratulated and asked about it on the I-6 interview trail, and it was a wonderful addition to my application. Including the award in my CV served as further evidence of my commitment to joining the field, which I think is critical for any CT surgery applicant. STSA will begin accepting applications for the 2015 Brooks Scholarship Program in the coming weeks. Second, third, or fourth year medical students training at a U.S. accredited medical institution in the STSA region are encouraged to apply. Applicants not training at an institution in the STSA region but who obtain a letter of recommendation from an STSA member will also be considered. Learn more about the Scholarship and application requirements. Contact STSA Headquarters with questions at stsa@stsa.org or 312.202.5892.